"As for finding the meaning of life, simply sharing time and making new friends in the company of other modelers was trueth enough for most of us. Certainly hundreds of high-quality models, but the vast majority were built by enthusiastic modelers whose skills are still developing. They were there simply to show and share their work at an NNL, where all modelers are created equal." If you're a die-hard model car builder, then the NNL West is one of those shows you look forward to every year (since 1985). If you live here in the bay area, it's a big national event right here in your back yard. If you're coming from other parts of the country it's a chance to get away from the bad winter weather and take in a great event in one of the most beautiful parts of the country at the same time. I'll never forget the guys from the MASSCAR model car club pulling grass from my front lawn and putting it in their pockets to take home! 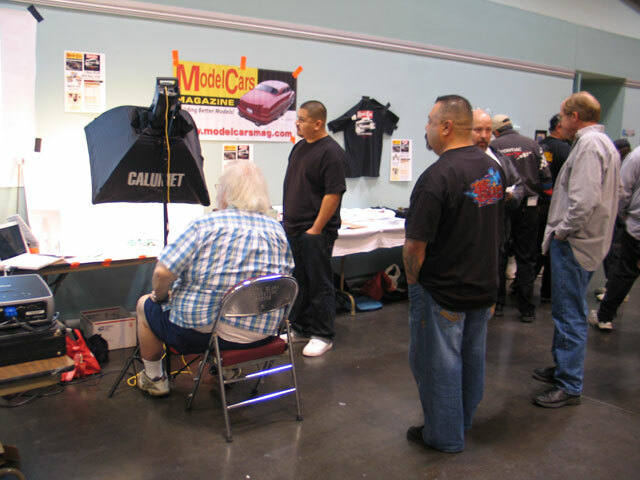 The NNL West is about a lot of things: it's about great looking model cars, it's about meeting old friends and meeting new ones, it's about maybe getting your model photographed for a magazine (did you see last year's coverage in the Scale Auto,Contest Cars, NNL Yearbook, & Model Cars? ), most of all it's about having fun. 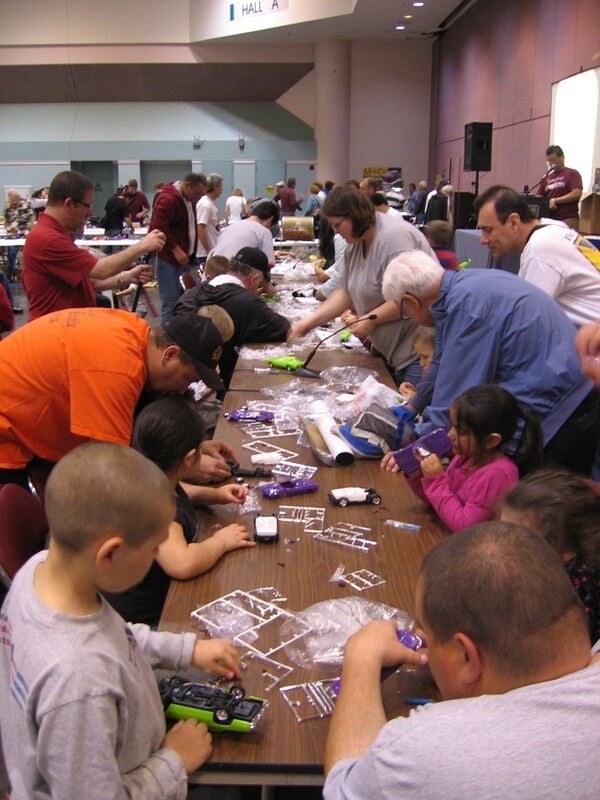 During the day you can check out the door prize table and maybe win a prize, or the kids can sign up for the "Make N' Take" program and have a chance to build a model right there, and then put it on the display tables. You can also walk through the NNL West Model Expo held in the same huge hall as the NNL. Vendors come from all over the country bringing great deals on the latest aftermarket parts, NEW kits, or rare old kits! Modeler's save-up all year for this great chance to stock up on modeling goods! The NNL West is a non-competitive event. The only two awards are the "Youth Modeler's Choice" award, and the "Adult Modelers Choice" award. But there will also be the NNL West "Staff Picks" again this year. I'm sure there will be others as the show draws closer (if your club is doing something special, email us and let us know!). 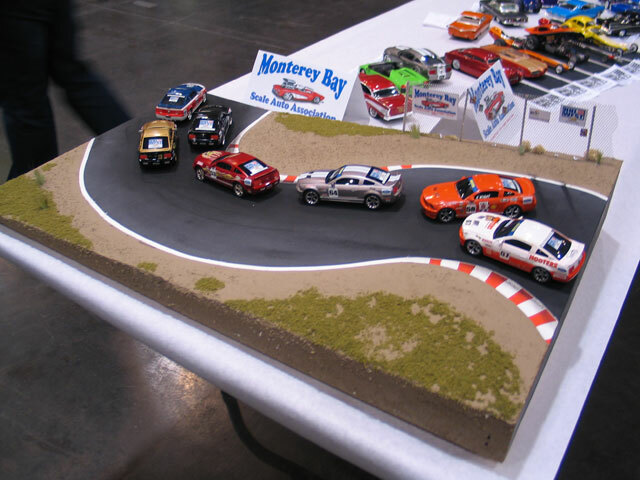 Model Car Builder magazine will present a special award each year. Keep your eye on the "What's New" page and we'll let you know. If it's your first time at NNL West let's give you a quick run down on what to do; first you'll want to buy tickets at the box office located in the lobby ($15.00 for adults, children under 12 yrs old free, ticket sales start about 8:30am, & doors open at 9am), make your way to the front door in the "A" HALL this year where NNL volunteers will take your ticket and give you numbered placemats to put under your models, take your models to a table and display them. You'll also receive door prize tickets but you might want to buy extra (there's a lot of door prizes to go around, but the more tickets you have, the better chance you have to win). If you have kids, sign them up for the Make N' Take. Check out the swap meet area. 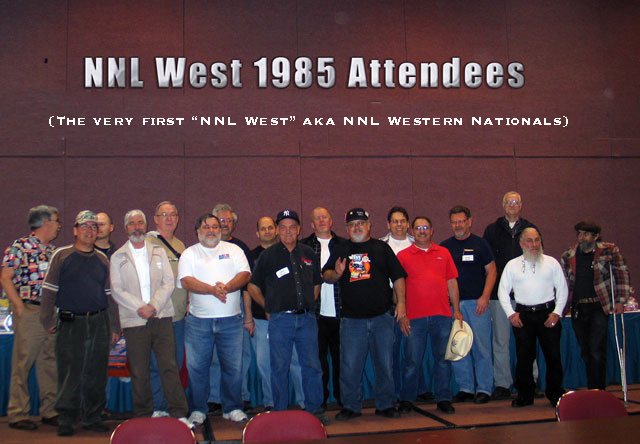 "Modelers from all over the country have learned that few events attract such a wide variety of indivuals, models, vendors and ideas as the "NNL West". 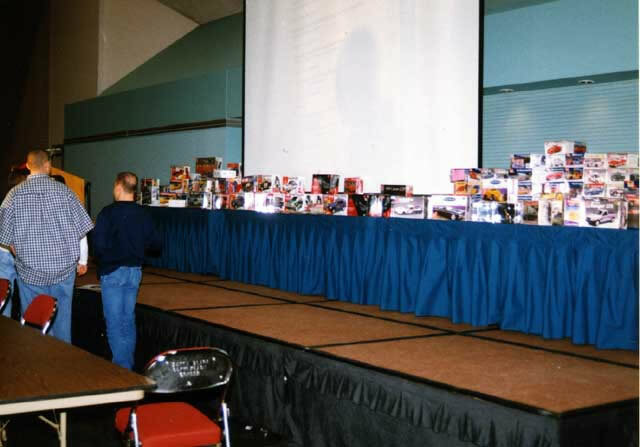 "So, after the long weekend exhuasted modeler's loaded their models into their cars, or baggage, for the long trip home, knowing that they just attended one of the largest (and most fun) model car events in the country." "Founders Roy Sorenson and Kevin Drake couldn't have imagined how big this show would become when they planned the inagural event some 16 years ago." Click on this flyer to get a full size version to print out and mail to friends or post at your local hobby shop. We appreciate any help you can give the NNL in spreading the word about our great event! At 3pm the last door prize drawing and awards ceremony will be held. Please stick around for the awards ceremony and cheer for your fellow modelers. But, as soon as the awards ceremony is over please pack your models as quickly as possible and leave the hall. The volunteer staff needs to clean the room and be cleared out by 4pm. Your cooporation would be greatly appreciated. There's an informal celibration dinner at the Sizzler Steak House down the street after the show. Speeking of volunteers; this show is manned by model car enthusiasts who are there strictly because they love the model car hobby and want to give something back to the hobby. The volunteers come from all over California, Oregon, and Washington, and the Unted States to help, so if you have any questions or need help with anything just look for a staff member in their "NNL WEST STAFF" t-shirts, and don't forget to shake their hands and say "thank you" at the end of the day! We look forward to "Seeing you in Santa Clara"